Scenic Float Trip or Whitewater Rafting: Which Should I Choose? A rafting trip on the Snake River is a wonderful way to see the Jackson Hole area in a whole new way. Both scenic float trips and whitewater rafting adventures are available from a variety of local outfitters. The question is, which should you choose? Here is some information to help you make up your mind. If you choose whitewater rafting, expect a thrilling, hands-on adventure that requires every person to participate. You will see plenty of incredible views, but your attention may be diverted by the need to pay attention to the raft. Safety Considerations: The Snake River Canyon features Class II and Class III whitewater rapids. These are strong enough to be thrilling, but they are reasonably safe. You might fall in if you are not on your game, but there is little danger if you do. All passengers wear high-quality life vests and guides keep a close eye on everyone. Even non-swimmers can safely enjoy a Snake River Canyon whitewater rafting adventure. Duration: Expect the 8-mile run to take 45 to 90 minutes, depending on water levels. Your full trip includes transportation to and from the river, or approximately 3.5 hours total. Plan for a 4 hour window to be on the safe side. Age Restrictions: Most outfitters set a minimum age of 6, though during the early season when the river is running high, a higher age minimum may be necessary. Always call before booking a trip with children for the latest guidance. Older adults and those with physical limitations should be aware that active participation is expected. 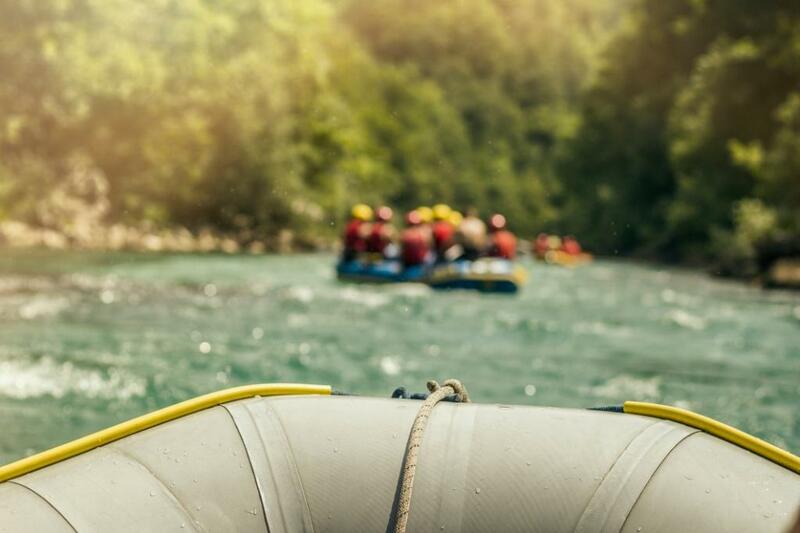 In general, if you can handle a roller coaster, you can most likely handle a whitewater rafting trip, but it is best to check with your outfitter for advice. Activity Level: Your guide will steer the raft, while you and your companions paddle in tandem to achieve movement. There are flat, calm areas that require little or no paddling, allowing you to take a rest. The activity is not strenuous, but you will get a mild workout. Getting Wet: Getting wet is a given on a whitewater rafting trip, and the front end of the raft is likely to receive the most water. Wear quick-drying clothing and protect your cell phone and other devices. A scenic float down the Snake River has been described as meditative. If you want to sit back and relax as you enjoy some incredible views, a scenic float might be for you. Please note that there are float trips available both inside and outside Grand Teton National Park. Both options provide very knowledgeable guides and stunning views of the Teton Range, along with local wildlife such as bald eagles and ospreys. Safety Considerations: A scenic float on the Snake River is considered incredibly safe. The water is lazy, and your guide will give you instructions on how to move around to avoid falling overboard. Duration: Depending on which section of the river you are on, your scenic float will cover 10 to 13 miles in 1.5 to 2.5 hours. Including transportation to and from the river, the entire duration of your trip will be approximately 4 hours. Age Restrictions: In general, children ages 4 and above are welcome on scenic float trips. Each outfitter is free to set its own minimum age, though, so be sure to double-check if you have small kids. Older adults and those with physical limitations generally have little trouble as long as they are able to safely navigate into and out of the raft. Activity Level: The activity level for a scenic float trip is basically zero. Your guide will do all the paddling while you sit back and enjoy the ride. Getting Wet: Some scenic float trips offer the opportunity to swim, but that is the only way you will get wet on your trip. The water is slow moving, and boats are generally equipped with splash guards. Bring your cell phone or camera to capture dramatic scenic shots, as well as binoculars for better wildlife spotting. Both whitewater rafting and scenic floating are excellent ways to take in the unique scenery of the Snake River. If you’re a thrill seeker and don’t mind getting soaked, whitewater rafting is the way to go. If you prefer to relax and enjoy the view, a scenic float is a better choice for you. Some outfitters offer a package deal that includes both options, meaning that you don’t actually need to choose at all. If you are looking for an affordable, less crowded, pet-friendly base camp for your Jackson Hole adventures, contact Flying Saddle Resort today at 877-772-4422 to make your reservation!